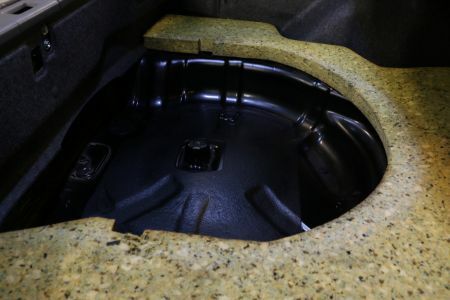 •25 years old in April 2018 makes it eligible for U.S market. 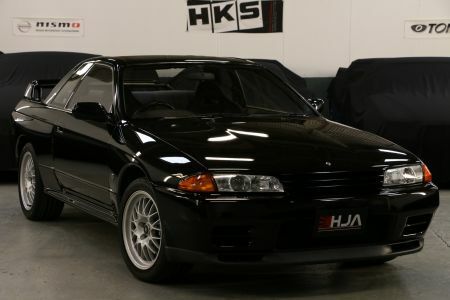 HJA present another outstanding R32 GT-R that has just arrived from Japan, this one in particular being a highly collectable V-Spec model. 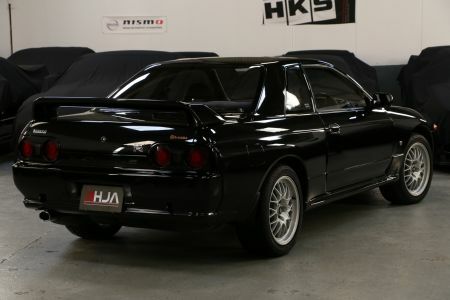 To celebrate the success of the GT-R in both Group N and Group A racing, Nissan introduced the Skyline GT-R V.Spec ("Victory Specification") car on 3 February 1993. The V-Spec added Brembo brakes and a retuned ATTESA E-TS system to the Nismo and N1 packages. 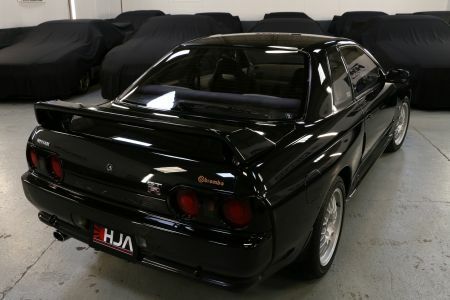 With only a total of 1,396 R32 V-specs ever produced only 131 were ever painted black pearl metallic from factory which goes to show how rare this R32 is. 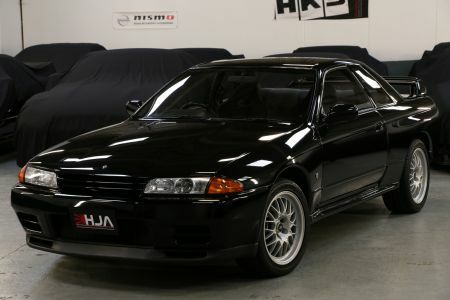 With the rapidly increasing prices of the rare model R32 GT-R’s now is the best time to buy before the prices will go out of reach for most. 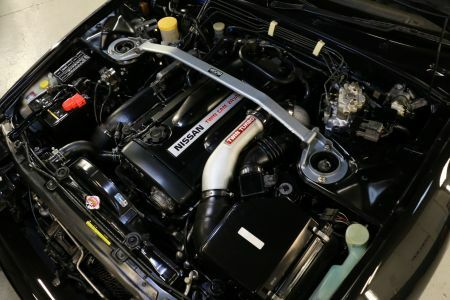 The huge worldwide demand for R32s have seen buying frenzy’s in Japan with prices continually on the increase for clean high-end examples. Bodywork is immaculate and has to be seen to be appreciated with glowing paintwork and crisp lines. It’s hard to believe this car was produced in 1993 as it almost looks like its rolled of the production line! All the panels are original and the car has no repair history which is exactly what you want with a collector/rare example. Interior is outstanding, it retains the original factory steering wheel/gear knob/gaiters and even stereo! 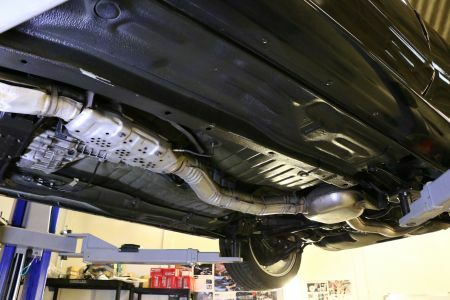 which is a real testament to how well the car has been maintained. 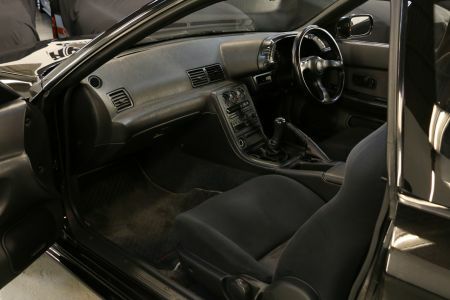 The dash is bubble free, all the carpet and plastic trims around the whole car are in fantastic condition. It’s not just exceptionally clean on top, underneath has to be seen to be appreciated- quite hard to believe this cult classic is 25 years old as the condition puts most new cars to shame! Just check out the pics and you will understand. It’s not far off how it would have rolled out from the factory; Strut towers are original and the rear arches/boot are in immaculate rust free condition. 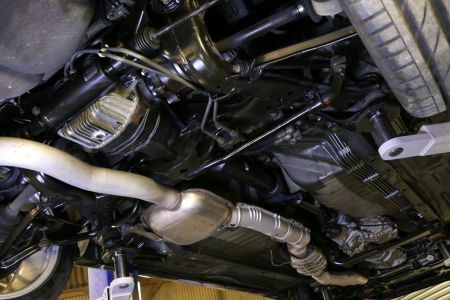 The engine starts and runs beautifully and is even still running the factory exhaust system. We have just serviced the car with all top branded products. Oil pressure and running temperatures are spot on. Gearbox is fluent with no crunches and clutch is perfect for road use, still running stock suspension with no knocks or rattles really goes to show how well the car has been kept.